*Important Notice*Some sellers (hijackers) are selling fake LESONIC products. We never authorize them to sell our products. LESONIC is ONLY Sold by "happyfishes". Buy only legitimate LESONIC items to avail full refund and replacement. Lesonic analyzed and researched various desk chair mats made from different raw materials, eventually POLYETHENE (PE) was chose to develop chairmat for hard floor. The classic black color suits any floor and any room. • Durable structure with high impact strength ensure long life-time. avoiding crack, bend, break, SCRATCH OR DISCOLOR. • ECO-Friendly, 100% recyclable materials. No smell, PVC free, BPA & phthalate free, and free from tin, lead and other metals. • No problem under -30 ℃ to +120 ℃, Suitable for underfloor heating. • 47 x 35 inch is perfect size designed for multi-purpose use as floor mat: Chair Mat, Wood Floor protector, Computer/Office Mat. As well you can place plants, ornaments, crafts, bike and other heavy appliances on it. • Unique surface texture for both side, With Bark pattern on the top which are designed to prevent scratching; With grippers on the underside which are designed to keep them firmly in place while in use. • This model is designed for hard floor only, not made for pile carpet. • When first use, please have the inside of roll face to ground to avoid mat edge and corner warped, it will take about 1 day to flatten automatically, putting some books on the 4 corners could help. Lesonic does its best to develop & provide nice products with good quality and aim for outstanding customer service. If anything goes wrong with your chair mat, or you decide it's just not for you, Lesonic will promptly replace it or pay you a full refund. Every purchased mat has a 100% 60 Days Money Back Guarantee. 100% PURE POLYETHENE DESK MAT - Odorless, Non-Toxic, PVC free, BPA & Phthalate free, and free from tin, lead and other metals, 100% recyclable materials to keep your healthy indoor environment. The classic black color makes the room slick and classy. WARNING - not suitable to use with carpets. THE LESONIC CHAIR MAT IN BLACK IS ONLY SOLD BY HAPPYFISHES, PLEASE BE AWARE THAT SOME SELLERS ARE SELLING A FAKE PRODUCT WITH A HIGHER PRICE. SUPER-DURABLE,NO CRACK, BEND, BREAK, SCRATCH OR DISCOLOR DESK FLOOR MATS - The unique surface texture allows your office chair casters to move easily while carrying out daily tasks, w/o leaving any mark on the mat, and helps to considerably reduce the risk of leg fatigue. 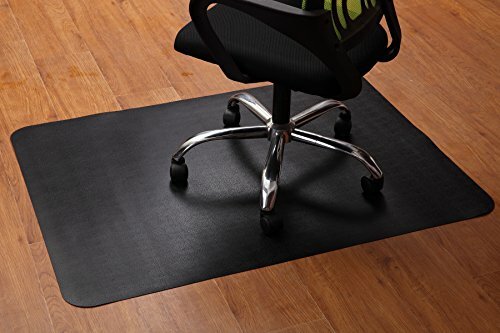 MULTI-PURPOSE FLOOR MATS FOR OFFICE - for using under chairs, computer desk, plants, ornaments, crafts, and more, it is rigid enough to support heavy duty equipment. Designed for hard floor surfaces only, suitable for: Hardwood, Tile, Linoleum and Vinyl. COMPUTER CHAIR MAT WITH ANTI SKID BACKING - 100% non-slip backing provides complete stability and holds the desk floor mats firmly in place while in use. Not only protects floors, chairs and appliances but also protects you from falling over or your chair sliding and falling over. FULL MONEY BACK GUARANTEE - Each chair mat you purchase comes with a 100% 60 DAYS MONEY BACK GUARANTEE. Get a 12 month worryless product warranty. We only aim to provide the best products and customer service. It's the best deal you can get so place your order now! If you have any questions about this product by Lesonic, contact us by completing and submitting the form below. If you are looking for a specif part number, please include it with your message.